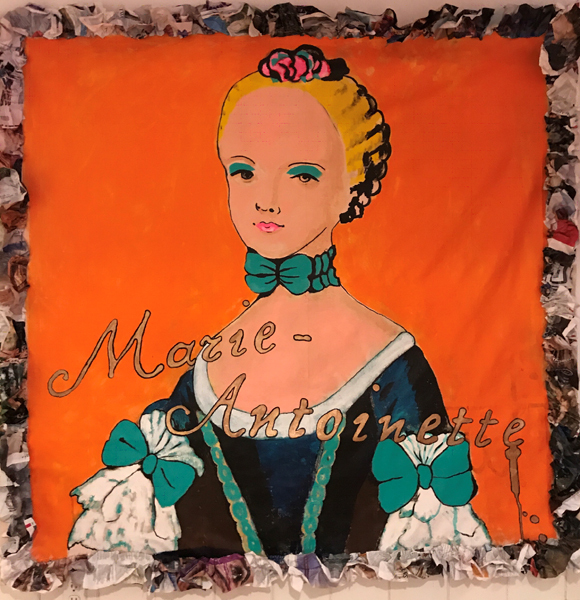 Meg, who has a lifelong love of fashion, paints images that show an appreciation for Marie’s fashion designs invented by Rose Bertin (founder of the first French fashion magazine). Costuming required huge wigs decorated with news objects of the day, such as replicas of a ship Marie funded on behalf of the American colonies getting ready to throw off British rule. Money was no object and Marie took advantage of that. After painting the first major official portrait of Marie Antoinette in 1778, to everybody’s satisfaction, the young woman Vigee Le Brun was regularly asked to portray the queen. So it is this infatuation with portraits that Meg uses as a springboard for her own interpretive portraits. While portraiture is a major viewpoint in this exhibit, freedom is also a major theme. Meg shows a side of the queen not usually seen. One in which Marie eventually leaves the court with all its masks and falsities behind, residing with her children in a less pretentious house in Versailles. In one mixed media piece, Meg constructs a figure from Vogue magazines and situates it coming from a wall of Gucci inspired images—illustrating the liberation of Marie from the court and all it represented. Likewise in her own life, Meg who was born in Holland and schooled in Nijmegen and Groningen at the Academy of Art Miner, also experienced a major transformation that led her to Spain. There she learned English and German before moving to London where she became a flight attendant. A yearning for the arts called and enrollment in St. Martin’s College followed. There she met her future husband. Together with their young family they located in Washington DC by way of Naples FL. The one constant in this nomadic life was painting, whether outside museums or with friends in classes and inspired by Frieda Kahlo, Diego Velázquez and Kehindi Wiley.